The paintings of Chuck Close prove that what looks like a photo realistic painting from a distance, can be something very different when you get up close (no pun intended on his name by the way). For those who are interested in contemporary art, William Blake may seem a rather odd choice to recommend seeing. I think, however that Blake has much to offer any artist no matter what style you lean towards. One of our tutors at Chisholm who is originally from the UK was influenced by Blake and now that I have seen more of his work, I can see much of where he gets his inspiration. Philip does very contemporary work and his compositions are imaginative and sometimes very confronting. His mix of body parts with inanimate objects has sometimes had me wondering where he got his ideas from. In Blake’s work today I could see little glimpses of Philip. The contrast that we give colour in our paintings adds the drama. Whether we use the methods from the early 15th-mid 19th Century or those from the Impressionists, or later, the way we apply colour and the tonal values we give it in any given part of a painting is what will make it stand out. Before the Impressionist era, painters relied on the contrast between light and dark. The colours available later on were not in production so artists created drama with light and tone. Look at the works of Rembrandt or Vermeer for example, very few colours but lots of use of light and shade. Beginning with Turner, who to many is the one who really began the Impressionists’ movement with his amazing use of colour, we see how much of a painting can be kept muted with receding colours and the addition of only a few higher key colours to create the frame and draw the viewer into the exact point the artist wants you to concentrate on. I am pleased to invite friends and followers to my exhibition at Oakhill Gallery, Mornington. The exhibition covers a body of work produced starting mid 2013 and leading to my Advanced Diploma Project for 2014. All works are for sale and a price list will be available at the venue. I look forward to seeing some familiar faces during the month. I am pleased to invite Students and Teachers to my exhibition at Oakhill Gallery, Mornington. The exhibition covers a body of work produced starting mid 2013 and leading to my 2014 Advanced Diploma Project. Alain De Botton is a new find for me. I watched a new program today where he gave a very interesting talk about how he sees the presentation and publishing of news to the world and how we react to it. As an artist you may think, what does this have to do with me? I wondered that in the first few seconds and then quickly changed my mind. It was not only from the parallels he drew with the church and the Renaissance, or even the use of art as political messengers through history so much as it was the dissection of how the news is gathered, how so much of it is discarded as uninteresting or irrelevant for the sensational and the “if it bleeds it leeds” mentality. Mornington Peninsula Regional Gallery has three separate exhibitions running at present and students studying Art from Chisholm Frankston went to a talk about one of the larger of the three and to look around the others. Jimmy Pike’s Artlines – contemporary art (drawings). Signature Style – a group exhibition of contemporary jewellery. Behind the Lines – 2013s “best” political cartoons. I had a quick look through the jewellery, but to be honest there wasn’t anything there to keep my attention for long. The cartoons were refreshing because for once I saw a balanced view of our nations and its politics. Rather than a huge leaning to the left, the cartoonists had an equal opportunity dig at all sides of politics. I found a lot of the work very well drawn or painted and some a little gross with the imaginative altering of some well known faces and bodies. Quite funny and some very thought provoking and to my thinking well worth a visit even if art isn’t your thing. The main objective of the visit was the Jimmy Pike exhibition. These drawings mostly done in text pen on sketch pad paper were presented beautifully which showed up the bright use of colour and mis of traditional cultural themes with the modern contemporary. Still not my thing really, and I had the feeling that your average pre teen could have come up with a similar body of work. I was more interested in the lighting and the control of air flow into the room. Great care is being taken to keep direct light off the works so they don’t fade, and to keep the temperature and moisture contact in the room constant. Proof that MPRG takes care for their exhibitions very seriously. If you like abstract-like imagery with some cultural references this still may be something you would like to look at. The work is divided into categories such as desert flora, various spirits and direction finding. If you have time left over, the Oakhill Gallery on the highway near MPRG is having a photographic exhibition at present (April 2014) which I have four photo prints in and for sale. 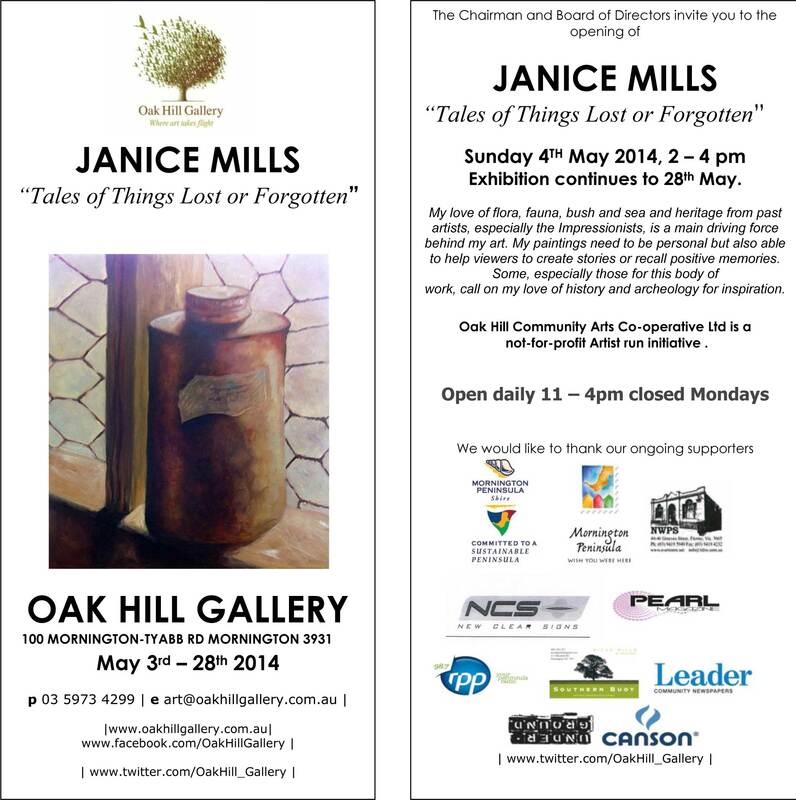 During May I will have Gallery 2 in Oakhill full of my work for the month. The “Lost” series will include paintings, pastel, bronzes and a high relief paster triptych sculpted and in shadow box frames. All will be for sale. The roses are still out in the rose garden nearby as well, for a nice walk. Understand from the beginning that I am writing this from a personal point of view. Having been an artist of one sort or another for most of my life, I understand when the demon in my personal life is raising its ugly head again. Adding to that is the amount of similarity I see in colleagues and artists in history. Art is a very subjective subject and a risky career choice. Many people who do not understand the amount of actual work and research involved in creating an artwork think that you are born with the ability and just sit in front of a canvas or whatever and easily churn out paintings, drawings etc.